Gingivitis treatment refers to any dental treatment aimed at reversing or arresting gum disease. Excuse me, folks. This my pet hobby horse. I have found that there is SO MUCH bad advice about gum disease on the internet, I'M FED UP. Particularly with homeopathic remedies and "oil pulling". These are mad-cap theories that have NO hard science nor evidence behind them, only pseudo-science at best. What really annoys me is that SO MANY people are taken in by these theories, and are given false hope. I feel so sorry for them. They waste their time and money, ending up no better off - indeed frequently WORSE OFF! So I'm going to tell it like REALLY it is. Hopefully some folk out there will benefit from these recommendations, that have a solid foundation in research and evidence-based science. Here's the TRUTH about gingivitis treatment and reversing gum disease. OK, so first of all, what IS gingivitis? Gingivitis is the word that dentists and hygienists use to describe gum inflammation. It is the mildest form of gum disease. 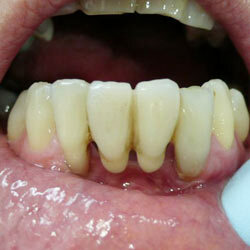 To be quite frank, almost all patients that I see have gingivitis to one degree or another. It is SO COMMON, it is almost "normal" ! As we said at the top, gingivitis treatment is anything that is aimed at getting rid of the gum inflammation. IF YOUR DENTIST HAS NOT TOLD YOU THAT YOU HAVE GINGIVITIS, the most likely reason is that he's fed up telling people! As a dentist, I know the feeling that all dentists get when you have to tell a patient bad news - no matter how minor. Sometimes it feels like you spend all day giving people bad news! The trouble is, most people don't want to be told that they have a gum problem, and they usually don't believe it when they ARE told! It reminds me of that old joke about it being a waste of time trying to teach a pig to sing; it never works, and it annoys the pig! So, it is not unusual for a dentist to be "burned out" telling people that they have gingivitis or gum disease. Most patients don't listen, and it annoys them to be told! So what's wrong with having a bit of gum disease? Surely it can't be too bad? Actually, there are BIG health issues! Gum disease is caused by bacteria collecting around your teeth. The one exception is gum inflammation associated with wisdom tooth pain. These bacteria cause inflammation, because your body recognizes them as being "foreign", like a splinter in your finger. What's WRONG is, this inflammation is not limited to your gums. There is a load of scientific evidence that gum disease can also cause heart disease, arthritis, osteoporosis, diabetes and stroke. For more information about how gum disease affects your health, go to dental health issues. In particular, if you have diabetes you must read my page about Diabetes and Gum Disease. As if it wasn't bad enough that gum disease can make your teeth loose and fall out - gum disease WILL affect your general health too! Heart disease or a stroke can kill you.The others just make life unpleasant. And yet gum disease is SO EASY TO PREVENT, if you just invest a little time in your own health. About 15 minutes a day. I've written a guide on How to Cure Gum Disease. What does gingivitis look like? How can I tell if I have it? There are several things to look for. Here's detailed information on Gum Disease Symptoms. Your gums bleed when you brush your teeth.If your hands bled when you washed them, you'd be worried, right? Same thing for your gums! Healthy gums do not bleed. Your gums are swollen or "puffy". Your gums are red. They should be pale pink! You have a bad taste in your mouth, or bad breath. Optimal gingivitis treatment. HERE'S MY LIST OF WHAT YOU SHOULD DO! Brush your teeth MORE SLOWLY, and for longer. Spend AT LEAST 6 minutes brushing! Even better is 8 minutes. This is the single most important thing you can do. JUST SLOW DOWN! Get a GOOD-QUALITY electric toothbrush. 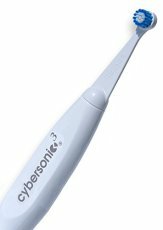 But don't just get any electric toothbrush - GET MY TOP-RATED BRUSH, THE CYBERSONIC 3. If you use my special DISCOUNT CODE you can get the Cybersonic3 at around HALF PRICE - that's just $50. Using a GOOD quality mouthwash may help too. I recommend Amazon for the TheraBreath Oral Rinse. At the dental office the dental hygienist can show you how to brush better. And she can show you where you are leaving plaque behind. But scaling and root planing will NOT help your gum condition UNLESS you are getting the plaque off your teeth yourself every day at home. Nothing can replace GETTING PLAQUE OFF YOUR TEETH EACH AND EVERY DAY. JUST BRUSHING SLOWLY AND FLOSSING UNDER YOUR GUM EDGES is the best gingivitis treatment. An extra cleaning method when you have gingivitis is to use a GOOD oral irrigator with a capful of TheraBreath Oral Rinse added to the water in the water tank. The ONLY oral irrigator approved by The American Dental Association is the WaterPik. I STRONGLY recommend it! So, unless you are willing to spend the time and money on a daily visit to the hygienist, it's up to you to do the job yourself at home! The BEST gingivitis treatment is WHAT YOU DO at home! Brush VERY slowly, for at least 6 minutes. Then floss carefully with dental tape. Did I say that already?